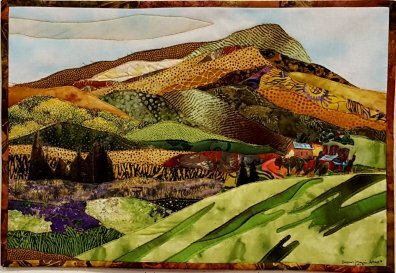 These California Landscapes are inspired by our wonderful backyard treasures in the SF Bay Area! The patterns are my own original designs. Come learn my raw edge applique technique that makes construction simple. These landscapes are recognizable locations to enjoy over and over again. Or share with friends and family remind them of a trip or vacation you shared together. 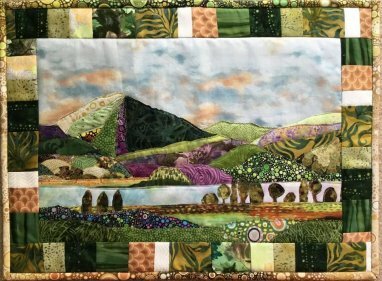 The class will include a discussion of choosing colors you love, evolving your own personal style, and how to continue your lifelong learning in fabric. I will bring books for inspiration. Bring fabric to share, if you are so inclined. You are welcome to pick selections from my personal stash, to complement your own. Each pattern is sold separately. Select one design to make in class and take another one home to work on your own (if you desire). Class fee does not include the $25.00 pattern fee. Each finished quilt measures approx. 11” x 17”. There will be kits available for purchase, or you may refer to the supply list for suggestions on fabric selection. I look forward to spending the day with you!!! - My love of fabric started at the age of 10, petting the fabric stacks at the local Woolworth and Newberry?s in Southern California. My family moved to Northern California to escape the smog, and I attended High School in Terra Linda (Marin County). I had the gift of two amazing mentors, Jack Haehl and Sheila Ford. 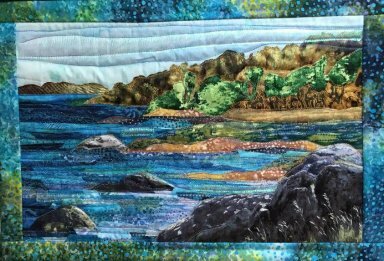 Textiles became my lifelong passion, for all types of fabric making, embellishment and design. I received my Bachelor of Arts degree in Textiles from San Jose State University. I discovered Art Quilting in 1997. It pulled together my most favorite aspects of sewing, photography, fabric embellishment and collage. My subject matter focus has been on the natural world, primarily in the East Bay which has been by home for the last 20 years. -I create most of my own patterns, from taking pictures on walks daily. Now that I am retired, I spend 4 to 5 hours a day in the studio, teaching and taking ?road trips? with my life partner, Ron. We live in Niles, Fremont. 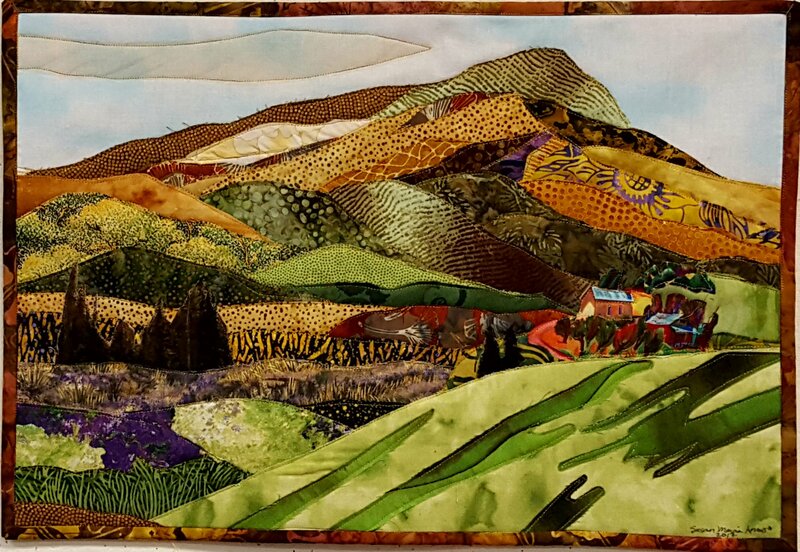 -I feel compelled to share my love of the Art Quilting with whoever I can, in hopes they also ?catch the bug?. I have derived so much pleasure and purpose in my creative adventures, I truly believe that my appreciation of nature, and the ability to find my creative voice is the best medicine in this crazy world. I hope you will feel the same way. Please join me in using the color wheel and my original patterns to help you develop your own style and expression. Learn time saving techniques and let your soul play! -Please contact me at 510-516-5669 or marciarrow@yahoo.com. For more information, workshop availability and pattern sales. All original art under copyright.